Buying natural gold nuggets can sometimes be confusing. The information in this article should help you to be an informed buyer so you can be confident about your purchases. However, be careful of gold fever (its a real thing). Once you have had the pleasure of holding a decent sized natural gold nugget in your hand, feeling it’s weight and admiring it’s tremendous beauty, you will likely catch a case of “Gold Fever”. They say the only cure for gold fever is more gold. In all seriousness, you should familiarize yourself with the measurements of weight that is commonly used to weigh gold. 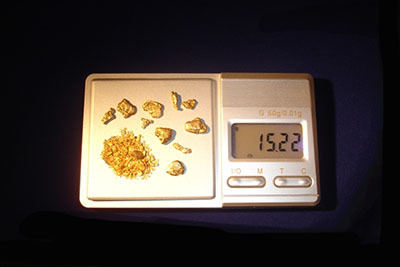 In general, natural gold nuggets are sold by weight. I say in general because there are some types of gold nuggets, like gold nugget crystals that will command such a high premium over spot or live gold prices that the weight is not really even relevant to the pricing. In the case of a gold specimen with multiple well defined gold crystals, the size and surface area is what is relevant, not the weight. Gold and gold nuggets are always measured in what is called “Troy Weight”. The following troy weights are the most important weights to understand when buying gold nuggets. “Penny weight” is also sometimes used, but this measurement of weight can be quite confusing so there is no good reason to use it and most in the industry no longer use this system. Like most fine things that are offered for sale, gold nuggets come in different qualities or grades. Click here to go to our article on grading gold nuggets. Many natural gold nuggets sold today are just small rounded chunks of gold without any real unique shape or character, often with unattractive quartz or other host rock attached or included, and often with heavy mineralization and mineral stains. This type of gold nugget is known as melt grade or common grade gold nuggets and is not worth much more than it’s melt value. You would expect to pay close to spot gold prices for this type of nugget. If you are buying gold simply for it’s melt value there are a lot of sellers who sell these types of melt grade or common grade gold nuggets, but you will miss the collectible and investment value of the high caliber and quality jewelry/investment grade and museum grade gold nuggets that you will find on our website. Jewelry/investment grade natural gold nuggets are at the very top of the quality grade scale. That is what we specialize in. They come in all sizes and weights, and they always command a much higher premium over spot gold prices or a lower grade natural gold nugget. At our company, each jewelry/investment grade gold nugget has been hand selected and they are often thin and flat (the shape preferred by most jewelers) and clean and brite, without any significant mineral staining or quartz/host rock (also called matrix). They are also chosen because they are pleasantly shaped with attractive features and texture. Every item on our website is a “hand selected jewelry/investment grade gold nugget”, unless otherwise stated to be collectible grade. We do not sell melt grade or common grade gold nuggets. Jewelers love small jewelry grade gold nuggets for inlaying onto rings, watch bands, necklaces, etc., and they use larger jewelry/investment grade gold nuggets to make pendants or necklaces by carefully soldering a gold bail onto the nugget and hanging it on a gold chain. On our website you will even find a category named gold nuggets for pendants where we have listed nuggets that have a specific shape that lends itself to making into a gold nugget pendant. Jewelry/investment grade nuggets are also preferred by investors as they are in high demand from jewelers and collectors and therefore easier to resell at a high premium. Next we have specialty collectors nuggets, which include the jewelry and investment grade nuggets mentioned previously, in addition to crystalline gold nuggets, gold nuggets crystals, and gold in quartz specimens. A complete collection will include something from each of these categories, and you will find a wonderful collection of the highest quality gold nuggets and specimens on our website.